Following the International Womens Day march we took a long walk through High Park which is just shy of 400 acres in size. A short subway ride west of the city, the park has everything from a swimming pool to a small zoo. During winter the many trails within are used for cross country skiing. Charlene, who we had given travel advice on visiting Australia a few months ago, returned from her journey earlier this week. We meet with her over a dinner at a Korean BBQ resturant to catch up. The tables house a small gas BBQ in the middle on which you cook your own food (pork, beef, chicken, ribs, salmon). Being all you can eat we of course ate far too much leaving a little rounder than we had arrived. Which brings us to the title of this post. One of the ‘must do’ things on my list of Canadian tourist activities was ice skating on an open-air rink. I had hoped to do this on a natural lake but none have frozen enough due to the late starting winter. The next best thing is the ice rink right infront of Town Hall at Nathan Philips Square. Being about 8:30pm when we started it was quite dark with only half the rink really illuminated by lights on the three ‘Freedom Arches’ (one of which has a chunk of the Berlin wall at its base). I’m not sure if the lack of light was a hinderance or a help though. 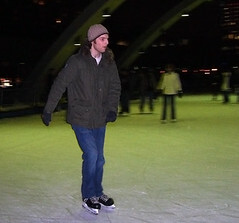 Many Canadians are surprised to know that I have actually ice skated before, albeit probably about 12 years ago. Either skating gets harder as you age or I wasn’t quite as graceful back then as I remember. My first thought as I stepped onto the ice was ‘great, I just paid $9 to cling to a fence for 2 hours’. It didn’t take too long for me to get my head around it though and wobble my way around the rink. Gemma on the other hand was left clutching the fence at times. Actually she did quite well for a first go and managed a few laps of the rink while holding my hand (truth be known she was holding me up as much as I was holding her!). Apart from a blister on my heel there were no injuries, which by our standards means a good night out.